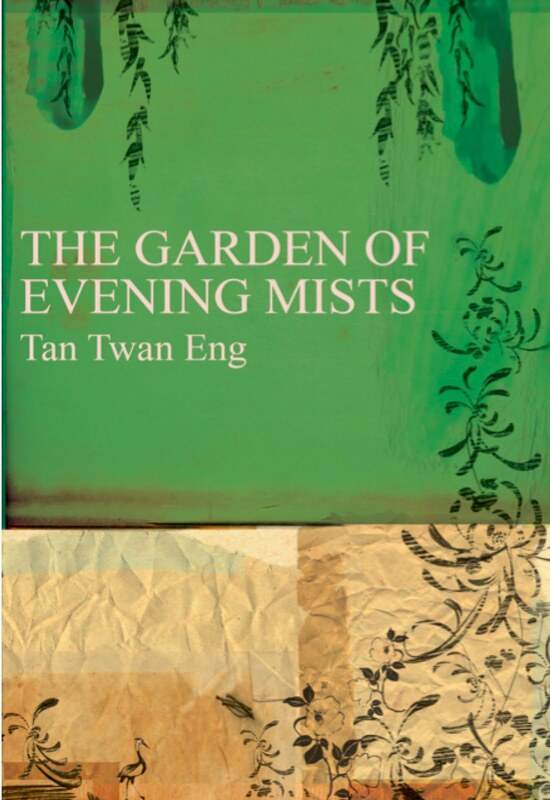 At the heart of Shanren’s development and that of the novella is the expressive relationship between formal elements which relate and resolve into images on the page and in the mind of the viewer. It is an interesting question where that image actually resides – on the page or in the viewer? Such an understanding of events as foci within a broader field allows us to understand the significance of each brushstroke as one element within a network of elements and, crucially, as implying a whole field of significance and space in the whiteness surrounding each line. Nowhere is this more apparent than in the purely formal description of the process of composition Weihe provides for many of the eleven pictures in Sea of Ink. It is only after the picture is completed and Shanren steps back that the image resolves, and he discovers the field of interaction and its significance. 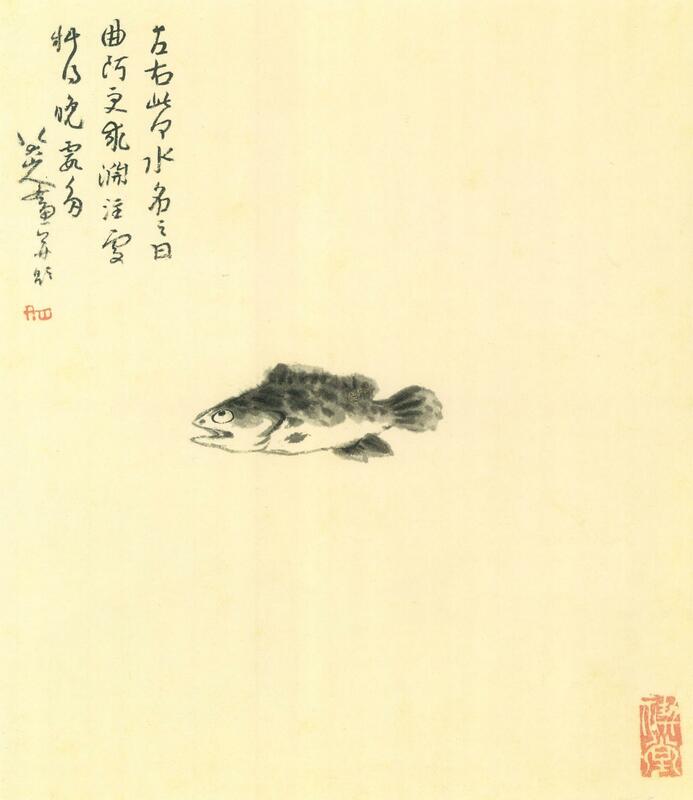 In one picture, Shanren has a fish gaze at his signature, thus dramatizing the reciprocal relationship between the artist, the viewer, and the viewed. The meaning of each painting, its communicative act, thus lies in the space between the two. At the height of his powers Bada Shanren calls as much into being with the absence of a brushstroke as he does with its presence. The ink structures but does not constitute the artwork. We might say much the same of the novel. Ink is watered rendered visible, nothing more. The brush divides what is fluid from everything superfluous. Of course, Weihe’s writing stands in a reciprocal relationship to its subject matter, for each chapter stands as a brushstroke: one element which both stands in a reciprocal relationship with every other chapter and which implies far more than it explicitly lays down. Both novella and drawing resolve as one steps back to grasp the whole. That Weihe grasps the philosophical, aesthetic, and practical issues at play in Shanren’s practice and development, and is able to express them in the style he adopts, makes Sea of Ink very impressive indeed. When Shanren is called to take part in the Qing project to document the history of the Ming he is assigned to the highest category of scholarship: the Sea of Ink. He feigns madness to escape the project, but the image lingers and Bada dreams of being a fish swimming through ink and the images he has painted. In the dream he fears shrivelling under the gaze of a government commissar involved in the history project. It is as if the fixing of things, looking backwards, is deadly to the creative mind. As is suggested both by Shanren’s dream and his composition, it is in the nature of creativity is to be exploratory. The resistance of creativity to analysis is precisely in its necessarily exploratory nature. One can say what was creative, but what will be is rather more difficult. The nature of creativity and its relationship to originality is a key question in philosophical aesthetics. Theories differ in their details, but one recurrent them is that compete immersion in an artform is a prerequisite for true creativity and progress. The metaphor is obvious. In another picture Shanren depicts a man on a mule riding into the mist. The mule seems to stare out at the viewer, apparently asking a question: a question which is at the heart of artistic progress, the space which surrounds each brushstroke, and Shanren’s lengthening years. It once again demonstrates the careful, expressive, and economical style of Weihe himself (and his translator), in that it contains the artistic, the philosophical, and the human in one succinct phrase. ‘what kind of dream are we are we riding into’? 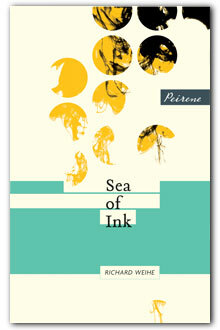 Sea of Ink is out now from Peirene Press. My thanks to Peirene Press for this review copy. ‘…if there is any true thing in this world it is that war is only like itself.’ – Kevin Powers in his foreword. War novels abound yet one rarely feels that they are of war. Generated, sustained, and hollowed by the incommensurable physical and mental arithmetic of metal and flesh attempting to occupy the same space, The Yellow Birds resonates in the space it digs out for itself. It is split between John Bartle and his friend Murph’s service in Al Tafar in Nineveh Province of Iraq in 2005, the months preceding that deployment, and Bartle’s post-war experiences in Germany and Virginia. The brilliant opening paragraph sets the brutal scene in beautiful language. The war tried to kill us in the spring as grass greened the plains of Nineveh and the weather warmed. We patrolled the low-slung hills beyond the cities and towns, moved over them and through the tall grass on faith, kneading paths into the windswept growth like pioneers. We soon learn that Murph died in Al Tafar and that Bartle’s promise to the boy’s mother to bring him home safely hangs over the returned soldier. What actually happened to Murph becomes more and more of a question as the novel develops and the responsibility which Bartle tried to flee by joining the Army catches up with him and emerges as a central concern of the novel as he struggles to stay afloat. We’d had small lives, populated by a longing for something more substantial than dirt roads and small dreams. So we’d come here, where life needed no elaboration and others would tell us who to be. When we finished our work we went to sleep, calm and free of regret. Responsibility is a perennial counterpart of the narrative construction by which we seek meaning in our past and present. The narrative creation of self, be it healthy or otherwise, strains under the weight of the experience of Bartle and Murph in Iraq. Suddenly the responsibility they sought to avoid is tested time and again in combat and in making sense of their actions and potential deaths. War is the great maker of solipsists: how are you going to save my life today? Dying would be one way. If you die, it becomes more likely that I will not. You’re nothing, that’s the secret: a uniform in a sea of numbers, a number in a sea of dust. And we somehow thought those numbers were a sign of our own insignificance. We thought that if we remained ordinary, we would not die. It is testament to the poetry of Powers’ writing that I found myself wanting to read large parts of it out loud. Yet, a novel is not sustained by lyric beauty alone. Powers’ lyricism is balanced by intense moments of ravaged thought which spill from Bartle as he despairs of any construction which might be put upon and thus make sense of his experiences either for himself or for others. I cannot help but wonder if it is Bartle or Powers we are hearing from in these moments. I am not sure it matters. I have not quoted the brilliant central section in which Bartle wonders what he might tell people about the war and his role in it if he were to just let go because one needs it in its entirety for the full effect. It is merciless and powers the book forward at a moment when one might have feared stagnation. Perhaps, as the most disordered passage of the novel, it achieves, on Powers’ terms, the greatest authenticity. Or perhaps not. I realized, as I stood there in the church, that there was a sharp distinction between what was remembered, what was told, and what was true. And I didn’t think I’d ever figure out which was which. That Powers questions the possibility and value of a narrative account of war, of anything, implicates his work as well: as I am sure it is meant to. To make sense of something is to take responsibility for it, at least for that interpretation; and to take responsibility is likewise to make some sense of it. That The Yellow Birds is far from linear is part of this point of view, for memory and interpretation are lateral and tangential operations of mind. What is it, then, that narrative can do? Perhaps the message of The Yellow Birds is that narratives, stories, aid us in only in everyday life and at the expense of an appreciation of the true chaos both of war and of all patterns of signification. Everything I could recall about the war flashed kaleidoscopically, and I closed my eyes and I felt the weight of time wash over my body, I could not pattern it. None of it made sense. Nothing followed from anything else and I was required to answer for a story that did not exist. Geoff Dyer chose this line of Joseph Brodsky’s for an epigraph to his superb The Missing of the Somme, ‘Remember: the past won’t fit into memory without something left over; it must have a future’. The future is barely alluded to once Bartle leaves Iraq and even during his tour the preoccupation is with the next mission, the probability of death, and fear for Murph’s mental state. Memory and the will to action which disintegrates after the war can only be restored once a future is in sight. It would not do to call The Yellow Birds optimistic and yet it is part of its power that Powers’ novel is not wholly pessimistic either. The novel hovers in the space between beauty and savagery, order and chaos, cohesion and disintegration. It is, I think, a great novel and, like all great novels, it will reward many readings. It is not enough to say what happened. Everything happened. Everything fell. 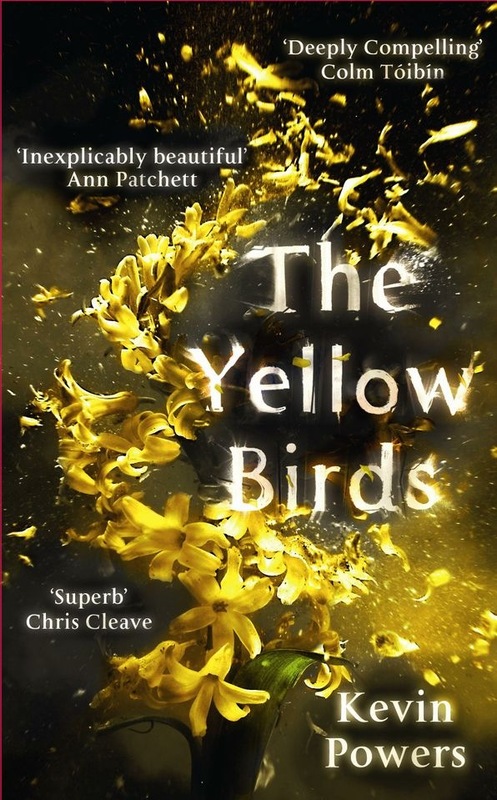 The Yellow Birds is out now from Sceptre. My thanks to Sceptre for this review copy. The White Goddess is the inaugural book for Norfolk-based publisher Galley Beggar Press as well as Simon Gough’s debut. It’s a heady and heavy-weight mix of memory, passion, deception, and poetry set in the Spanish sun on the island of Majorca and in Franco’s Madrid. It is the first of two ‘Auto-bi-fantasies’ – as Gough insists on calling them – which deal in novelistic fashion with the author’s tempestuous relationship with his poet ‘grand-uncle’ Robert Graves and his passionate love for the muse Margot Callas, the White Goddess herself. The narrative moves between the middle-aged and cancer-stricken Gough of 1989, his ten-year old self in 1953, and the teenager of 1960. All three are in love with Deya, the home of Robert and Beryl Graves, their wild son Juan, beautiful daughter Lucia, and many bohemian hangers-on in the villages surrounding the house. He first arrives with his brittle mother Diana in the wake of her divorce from the actor Michael Gough and falls in love with the island as he and Juan perpetrate plenty of mischief in the first major section Genesis which culminates in a drug-induced frenzy of magic and self-harm aimed at binding Simon to the island forever. Everything I could see could see me. Everything I felt and did would be left here, like an indelible stain in time, as a charm to bring me back. (There are a lot of italics and dashes throughout. It must have been hell to type). One can see where all this is heading and Gough draws it out well, perhaps too well after a certain point. Graves’ frightening breakdown underlines both the great heights and the profound depths that creativity and its inspiration can bring with it. One could and should question the degree to which those around him defer to his behaviour and his fierce belief that loyalty is owed to him and him alone: ‘Your loyalty is to me!’ he cries as things come to a head in the Majorcan sun. One of the revelations of The White Goddess is its inclusion of Robert Graves’ poetry, much of it inspired by Margot. As well as demonstrating the heights that Graves could reach (I’m not convinced that he always hit the mark) the relation of the poems to the events in the book is highly effective and lends a great weight to the emotional torment and near-madness the poet felt when his work was threatened. Graves appears to have been convinced of the affinity between poetry and the feminine, finding a focus for that sentiment in the perceived caprice of both. (Hence his book The White Goddess which outlines his theory of the nature of poetic myth). Indeed, throughout the novel women seem to be both the cause of and the answer to most problems one might care to name. Graves’ indefatigable and long-suffering wife Beryl props up the fairly useless men, while Margot and others entangle, aid, and abandon various bohemian and literary types, all whilst looking rather ravishing in the sun. As one might expect of a debut novel this is a passionate and occasionally uncontrolled work. There is a little bit too much weeping, banging his head, and moping in bed from the protagonist than seems strictly necessary. Of course, if this is what happened Gough might argue he should represent it, but he does emphasise that this is a novelised autobiography, so the moping might have been minimised for the sake of the reader. But then this novel does nothing by halves. It is a rich espresso served in a bucket, which is as intoxicating and occasionally hard to stomach as its sounds. The sun and its punchy presence bolster the febrile nature of Gough’s recollections and passions. That feverish pursuit can lead to the occasionally overblown phrase ‘Memory – so innocent and naïve in itself, so potentially fatal when stirred, like the coiled snake that it was in its pluperfect lair’, but that can be excused because it is this enchanted aspect which underpins the mythic aspect of Gough’s writing. Myth is an intensification of human experience for the purposes of warning and praise: Robert Graves is a fitting idol for both, towering as he does over the lives of Gough’s friends and family. The whole thing feels like a (very long) dream. The White Goddess is enthralling in every sense of the word as it flings the reader head-on into a chaos of desire and inspiration, deception and place. The spirit of place and the spirit of poetry orbit and constrict the figure of the Muse which is their liberation and their undoing. This is a book I would encourage you to throw yourself into, accepting the frustrations that may come as indispensable to the sheer energy of the writing and the force of recollection, even if it is sometimes exhausting and might be sleeker in places and the structure clearer. There is a moment in Toledo when Margot is lost in El Greco’s The Burial of the Count of Orgaz that might stand not only for Graves himself, but for the transition between interment and apotheosis that Gough is aiming for in the novel: a luminous but grief-stricken realism of ashen flesh transforms into the pliant radiance of the divine as the picture stretches upward. That tension between flesh and heaven is as responsible for The White Goddess’ power as it is its shortcomings. I recommend you see for yourself. The White Goddess: An Encounter is out now. I must come clean immediately and point out that I have not read all of the Booker Longlist. I managed six, which is exactly half of the longlist. I have two (Narcopolis and The Garden of Evening Mists) left over which I will read and review soonish. So my predictions are based on my own reading and that of people whose opinions I set some store by. They should be read as much as a list of what I would like to see shortlisted as of what I think will be. It undoubtedly suffers from my not having read everything. (The full Longlist is here). Any novel of London needs to do three things: it must capture the web of human and geographic relations and transitions that underpin each neighbourhood, it must capture the energy of the streets, and it should do justice to the languages of thought and speech which unite and separate all of the city’s inhabitants. NW succeeds brilliantly on all three counts in wonderfully economical language of its own even if the novel is not flawless in other respects. NW focuses on two childhood friends who escape the Caldwell estate they grew up on in Willesden (Smith’s childhood home). Leah Hanwell is white and of Irish descent, whilst Keisha Blake (who transforms herself into Natalie Blake) is of black African descent. Both face prejudice, especially when Leah marries a black man herself. The phrase ‘No offence’ fails to take the sting out of her colleagues’ complaints: ‘for the women in our community, in the Afro-Caribbean community, no offence, but when we see one of our lot with someone like you it’s a real issue.’ Natalie works hard to get to university and become a lawyer, apparently against all the odds, where she meets her mixed race husband Frank who has always lived a life of privilege and who seems immune to the suspicion apparently directed towards his wife. Both women feel their background and current circumstances alienate them from themselves and others. Natalie is trapped by the apparent freedom she worked so hard to attain, whilst Leah is trapped because she lacks the drive her friend needed to exceed the constraints she herself was never subject to. The idea of being one’s ‘sole author’ is examined from every angle by Smith. Time and again Natalie speaks of having escaped and exceeded her origins. Leah seems to refuse to author anything, stuck in a mire and refusing motherhood, whilst Natalie submits to the role out of propriety as much as anything else. Keisha/Natalie symbolises the divided nature of a minority’s ambitions and identity whilst Leah’s stagnation stands as a clear warning that no easy answer in terms of colour, creed, or family background can be given to explain the various fates of NW’s inhabitants. I’m from SE London rather than NW and of a very different background from the characters of Smith’s novel. However, the speech of Kilburn and Willesden is not all that different from where I grew up and went to school. The language of Shar, whom we meet as an apparent petitioner at Leah’s door, instantly transports us to the context of NW. 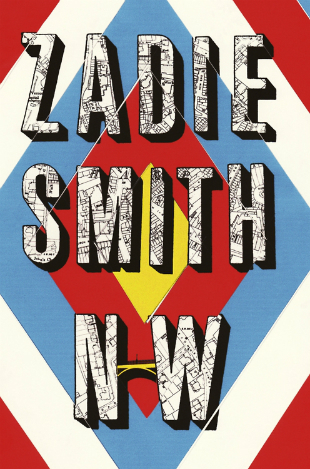 (‘Thank you, yeah?’) And speaking of the shaping of language and thought, Smith occasionally emulates the forms of concrete poetry, especially in the earlier parts of the book, which serves to emphasise this connection between perception, representation, and language very effectively. Smith’s writing in NW is at its best in the central section ‘Host’ composed of one-hundred and eighty-five numbered passages, some only a sentence long, others several pages. These passages chart Keisha’s childhood, adolescence, and adulthood, with each adding a detail to the tapestry of moments that Smith presents in a reciprocal relationship of manifestation and generation. Each episode defines as well as expresses the process of Keisha Blake becoming Natalie De Angelis whilst a void remains at the centre. Her life is all structure and façade without any substance that she can find. ‘Host’ is a masterpiece all by itself, assuredly depicting the contradictions and quandaries of Natalie’s life in an accumulation of aphorism and narrative. NW is suffused with philosophy both tacit and explicit. As Leah studies in Edinburgh, it’s hard not to wince at those incredibly cringeworthy but utterly necessary (and familiar) undergraduate moments when one lectures friends and family on partially understood philosophical theories. The age-old philosophical questions of identity and responsibility that a new-found self-awareness bring motivate much of NW. Indeed, Smith’s novel stands for responsibility, but this responsibility is far from reductive, and whose responsibility is fundamental is far from clear. Which is just as it should be. The foundational Camusian question of suicide raises its head more than once and, indeed, it is Camus, Kierkegaard, and Montaigne who hover behind much of troubled thought in NW. Which is not to say that the book is heavy-going: far from it. These thinkers wrestled with humanity and its unavoidable accompaniment, finitude. Smith’s achievement is in humanising such reflection in a stripped down manner that is both intensely contemporary and yet timeless. Issues of community, identity, language, perception, consciousness and self-awareness, and obligation in one part of London echo across all of human history. That sounds grandiose, but Smith renders each local. What makes complete sense to an inhabitant of Caldwell, and which used to be understood by Natalie, is now beyond her. That language, that mode of thought, has disappeared. To continue the philosophical theme and to mangle Wittgenstein slightly, “the truth of certain empirical propositions belongs to our frame of reference.” Natalie’s frame of reference has changed and fits smoothly nowhere. What is true to her, self-evident even, fits neither within the frame of reference of her childhood friends and family, nor in that of her husband and co-workers: a void opens up in consequence, which she tries to fill in the most incomprehensible of ways. Beneath all the existential angst is the casual and shocking violence any inhabitant of London is familiar with. ‘Respect’ seems to have become so twisted a concept that its undermining equates to instant violence and murder. One senses that it is this aspect more than any other that Smith reveals her true feelings. It is where her language becomes most committal in its portrayal and where the dichotomy of community and justice becomes most apparent. NW is not without its problems. ‘Guest’ which follows the Felix as he tries to turn his life around is less convincing than the passages which focus on Leah and Natalie, its motivation and drive less clear and plausible than the rest of the novel. There is also a moment in a playground where Natalie and others lambast a boy for smoking which feels a little forced. But these are small concerns within the greater whole of the novel. Allusive, multi-layered, and endlessly interpretable, NW is as rich, complex, and refractory as its subject matter. It will reward many rereadings. Alongside Keith Ridgway’s very different Hawthorn and Child it stands as one of the great books of London. My thanks to Penguin for providing this review copy. How Denis Johnson does what he does is beyond me. Train Dreams is a 116 page long masterpiece of remarkable richness that documents the harsh and tragic life of Robert Grainier amidst the disorientating transformation of the American West he helped tame as a bridge builder and logger for the railways. As is so often the way with Johnson, the weight behind each sentence is remarkable, even as each line appears innocuous; and this brooding power underlines the most human of experiences whilst allowing the passages where the visionary breaks through to take one’s breath away: the final passage is simply stunning and echoes back through the pages. In the summer of 1917 Robert Grainier took part in an attempt of the life of a Chinese laborer caught or anyway accused of, stealing from the stores of the Spokane International Railway in the Idaho Panhandle. Train Dreams opens with a founding event, the attempted murder of an immigrant worker by a gang of bridge workers, Grainier amongst them, their chosen method being to fling the man from the top of a half-constructed span. The curse Grainier believes the Chinese labourer to have put on him hangs above his head for the rest of the book, as his wife and young child are killed in a voracious wildfire, and he sets out to reconstruct his life in a lonely cabin. What I found most striking was the manner in which the apparently human – the rational, organised, powerful – was laid over the wild, the animal, and the deadly, rather than supplanting it. Few characters die naturally in Train Dreams and Grainier’s life spans that moment when the West still resisted the progress of a humanity Johnson questions: for it’s not only the landscape which is only apparently humanised through the arrival of the railways, but humans themselves. The interpenetration of the domestic and the wild, and the caprice of the apparently domesticated, is symbolised by the small red dog Grainier shares his cabin with, and who frequently disappears to run with the wolves. This contrast between the rational and the animal which together make up the human and the world we attempt to separate ourselves from is underlined by Johnson’s measured prose. Prose with the power to suddenly break out into a fleet-footed wildness which lurks beneath every sentence. Train Dreams is as much about the loss of that moment as it is its analysis. The railroad frames Grainier’s life and enters his dreams, inflecting their childhood recollections, but something clings on beneath them. Claire Vaye Watkins’ collection Battleborn also investigates the myth of the American West in its own way and shares the alternating tenderness and harshness of landscape and the kind of person one has to be to survive in it. Neither book allows the romantic to creep in, but that is not, of course, the same thing as excluding sentiment, of which there is plenty in both. Where Johnson excels in is the seemingly effortless and astonishingly compressed richness of this short novel.To be honest, I don’t know what else to say about Train Dreams other than that you should read it. Train Dreams is released on 6th September by Granta. My thanks to Granta for providing this review copy. In some ways it feels a bit odd to be reviewing each volume of Parade’s End rather than the entire novel. However, the sheer scale and complexity of the four-volume book militates against my being able to do justice to each volume’s particular concerns in a single review. If I can do any kind of justice to even one volume then I will be pleased. (I haven’t yet watched the BBC adaptation, so I’m coming to the books as it were unspoiled). I stand for monogamy and chastity. And for no talking about it. In Some Do Not… Ford subjects the brilliant and upright Christopher Tietjens to the disintegration of his rigid Edwardian psychology and moral code. Tietjens stands for an old, feudal, landed and taciturn class of Englishman; a man at home with the contours of birth, privilege, and society, whilst hating presumption and overt sentiment. For such a man to be married to Sylvia, a repulsive but beautiful adulterer without a hint of remorse or sympathy, whilst falling in love with the intelligent, witty, altogether charming Valentine, tests both his moral and social principles to the limit. 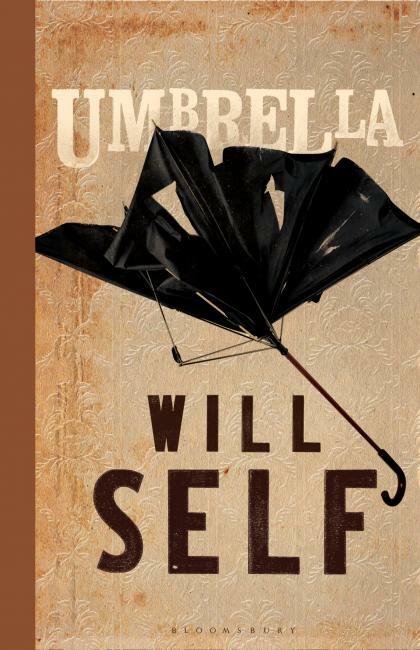 If you wanted something killed you’d go to Sylvia Tietjens in the sure faith that she would kill it: emotion, hope, ideal; kill it quick and sure. If you wanted something kept alive you’d go to Valentine: she’d find something to do for it. . . .
With the coming of the War and his service Tietjens seems broken, his brilliance slipping away, as the world in which he was so at home slips away amidst the bellicose tumult, whilst he retains the principles which keep him from divorce and happiness. He maintains that he is a sentimentalist at heart, and it is such sentimentalism which keeps him attached to the moral code the world seems to be shedding and, perhaps, never truly held. 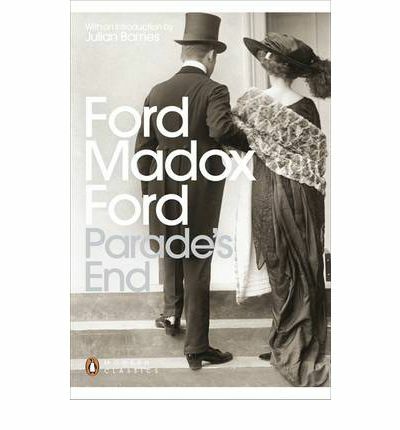 For Ford forcefully asserts the human realities that Edwardian society struggled to deny: fractured marriage, adultery, ambition, expression, and institutional prejudice and fallibility. Throughout the novel ‘Some do and some do not’ stand as summations of divisions of class, principle and service, most of which Tietjens manages to fall foul of, be it by resentment of his birth, his ability, moral code, or War service. She looked at Tietjens now with a sort of gloating curiosity. How was it possible that the most honourable man she knew should be so overwhelmed by foul and baseless rumours? 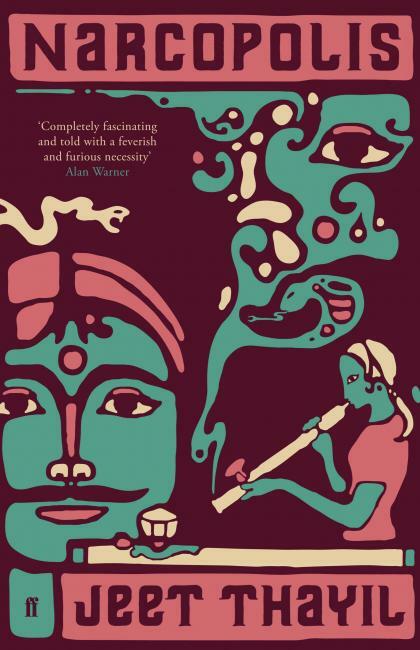 It made you suspect that honour had, in itself, a quality of the evil eye. . . .
You see in such a world as this, an idealist – or perhaps it’s only a sentimentalist – must be stoned to death. He makes the others so uncomfortable. He haunts them at their golf. Indeed, Tietjens’ own brother – a model of Yorkshire taciturnity – is more willing to believe in the possibility of serious moral and financial failings on Christopher’s part, than to countenance the error of a bank, a ‘prop of England’. It is Ford’s psychology which I so admire. He plunges the reader into the mental life of his characters as they twist and turn under the pressures of society, duty, memory, and love. The narrative is far from linear as we often find out about a character’s feelings about an event or individual only at the end of Ford’s investigation of their response to it. This renders our apprehension of the narrative as partial as any of its inhabitants and Parade’s End a far more modern novel than it might otherwise appear. A kind of fear seems to drive so many, epitomised, perhaps, in the person of Tietjens’ old friend Macmaster: a Scotsman of low birth who idolises the Romantics, and who is searching for security and esteem, everything his friend has without apparent effort or desire, and finds in the wife of a lewd madman the pillar he needs to rise. One has to be slightly concerned by the anti-Semitism which occasionally emerges in Ford’s novels, or, at least, that of his characters; and one rather hopes it is merely the latter. All one can really say at this point is that such things are a reminder of how prevalent such language and sentiment really was at the time. (Parade’s End was published during the 1920s). Eliot and others were as guilty as Ford, if not more so. Which certainly excuses nothing, but at the very least it gives a more rounded picture of a period when writers might also easily oppose Protestant and Papist within the work as a signifier of divided loyalties. A very different world. In the end we might censure Tietjens for the tenacity of his principled stand. For all his brilliance he lacks the flexibility to consummate his love for Valentine in any sense. He does not bend, he breaks as his world dissolves. But even then he cannot quite give in and Ford’s novel is greater for it. Roll on No More Parades. A man with doubts is more of a man, with eyes, hands, the need for food and for buttons to be sown on.